By Thomas C. Chidsey Jr. Potential Paleozoic shale-gas play areas for the Manning Canyon Shale and Paradox Formation in Utah, and the identified “sweet spots” for each play area. Over the past decade shale-gas plays in Texas, Arkansas, Louisiana, Oklahoma, and the northern Appalachian states have been the sites of extensive drilling programs using horizontal drilling and new hydraulic fracturing (or “fracking”) techniques (see related 2012 Survey Notes article, v. 44, no. 2, p. 8–9). Shale, a fine-grained sedimentary rock composed mainly of clay or mud, contains numerous pores (open spaces) that are very small but can store significant quantities of gas (or oil), thus serving as a hydrocarbon reservoir. The permeability (the connectivity of those pores that allows gas or liquids to flow) of shale is extremely low unless natural fracture systems are present. Horizontal wells are directed to encounter multiple natural fractures over thousands of feet, and fracking significantly increases the number of fractures and their permeability. The result of this drilling activity has been the discovery of an estimated 129 trillion cubic feet (tcf) of commercial, recoverable gas from shale in these established plays. Although Utah produces 0.4 tcf of natural gas per year, and has proven reserves of 7.0 tcf, all of this is in conventional (i.e., non-shale) reservoirs. 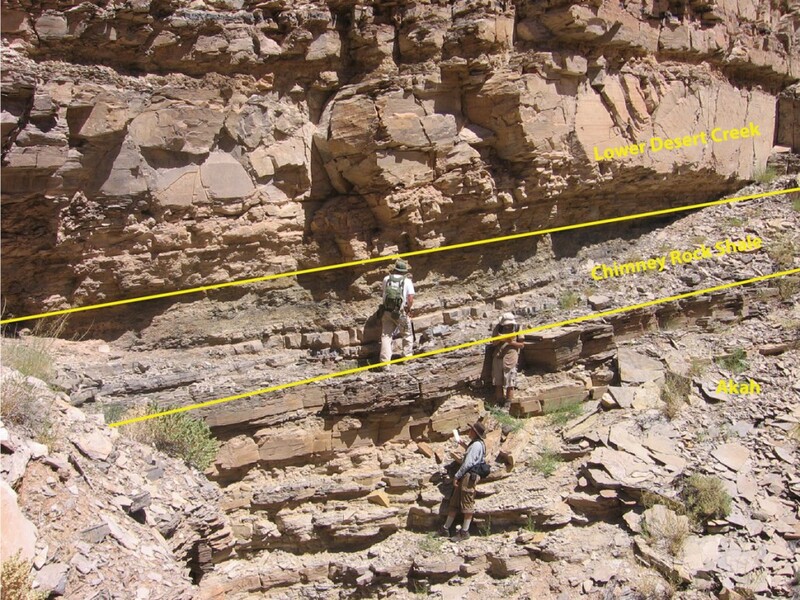 For the past four years, the Utah Geological Survey (UGS) has been conducting a major study of potential Paleozoic-age shale-gas plays in Utah, specifically the Mississippian Manning Canyon Shale in central Utah and the Pennsylvanian Paradox Formation in southeastern Utah (see related 2011 Survey Notes article, v. 43, no. 2, p. 3–5). These approximately 300-million-year-old shale beds are widespread, thick, organic rich, naturally fractured, and buried deep enough in many areas to generate, store, and produce natural gas and oil. The study was funded in part by the Research Partnership to Secure Energy for America (RPSEA) and represents the work of UGS staff, outside geologic consultants and engineers having expertise specifically with shale reservoirs, and various petroleum service companies and labs. The objectives of the study were to (1) identify and map the major trends for target shale intervals and identify areas having the greatest gas potential, (2) characterize the geologic, geochemical, and petrophysical rock properties of those shale beds, (3) reduce exploration costs and drilling risk, especially in environmentally sensitive areas, and (4) recommend the best practices to complete and stimulate these shales to reduce development costs and maximize gas recovery. 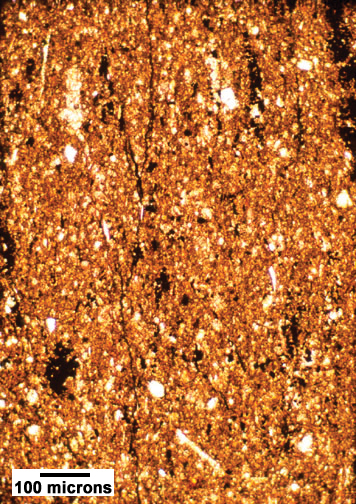 The UGS Paleozoic shale-gas study produced a number of key findings. The Manning Canyon Shale was deposited in a shallow restricted-marine, brackish, and freshwater setting like the modern Everglades and Florida Bay. Total organic carbon in the shale varies from 1 to 15 percent. Over time, the Manning Canyon was buried deeply enough to generate natural gas. The greatest Manning Canyon potential is a 600-square-mile area surrounding Price, including the northwest end of the San Rafael Swell. Several exploration wells in the area have reported gas tests and hydrocarbon shows. Potential shale-gas reservoirs in the Paradox Formation are estimated to contain about 6.5 tcf of gas, mainly in the northeastern part of the play area (the southwestern part is more oil prone with a potential for over 250 million barrels of oil). In addition, the study shows that overlying limestone beds, such as the lower Desert Creek zone of the Paradox, may also contain significant gas reserves. The resulting UGS publication, currently in the final stages of review, is titled Paleozoic Shale-Gas Resources of the Colorado Plateau and Eastern Great Basin, Utah: Multiple Frontier Exploration Opportunities. The publication will be in digital format and is anticipated to contain 11 chapters with over 180 figures and 30 tables. These chapters include (1) a geologic overview of Utah’s potential shale-gas reservoirs, (2) the geologic setting of the Manning Canyon Shale and Paradox Formation, (3) recent drilling activity (several wells have tested gas from shale in these formations), (4) visual descriptions of shale cores obtained from both new and old wells, (5) petrographic (microscopic) descriptions of the rocks from wells and outcrops, (6) geochemical analyses to establish organic content and maturity (capacity to generate gas) of the shales, (7) petrophysics and rock mechanics to determine porosity, permeability, and fracture potential, (8) identification of outcrop analogs, (9) a variety of thickness and top of shale (structure) maps, (10) recommendations for the best well completion practices, and (11) identification of play “sweet spots” that have the greatest shale-gas potential. Raw data, core photographs, laboratory analyses, microscopic images, etc., will be included in 21 appendices. Successful development of shale-gas plays requires integrating accurate geologic characterization and reservoir-specific engineering practices—a major goal of the UGS study. Our study results can be used by geologists, petroleum engineers, pipeline companies, landowners and other stakeholders, and local, state, and federal government officials and decision makers for the prudent exploration and development of these potential Utah shale-gas resources. For more information on the UGS Paleozoic shale-gas study, visit our Paleozoic Shale-Gas Resources web page.